Anodizing is a bright, permanent color coating that can be applied to any aluminum coin. These colorful and lightweight coins are great for Mari Gras, Sweepstakes Games, and Parades. They are perfect for distinguishing different denominations, or to tie in product packaging or team colors. 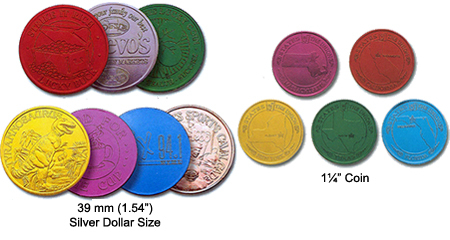 Our Anodized Aluminum coins and tokens come in four standard colors: Red, Blue, Green, and Gold. (Additional colors are available on request; however, we cannot provide exact matches). Any of our coins and tokens can be personalized with one of our 200 stock designs or with the image of your choice. Blue, Gold, Green, and Red (Additional colors available on request; however, we cannot provide exact matches).